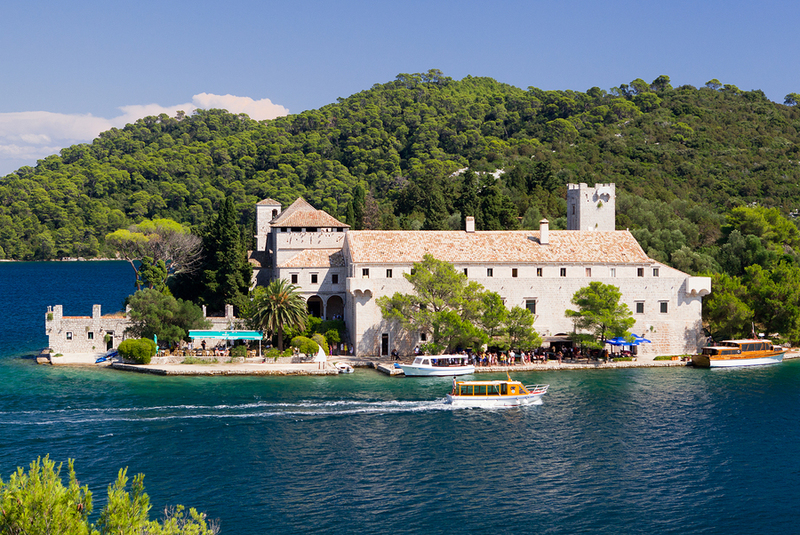 One of the larger islands along the stunning Croatian Coast, and a great location to cruise on a crewed yacht charter, the beautiful island of Mljet is usually either a first stop when cruising north out of Dubrovnik, or a last stop when cruising south before arriving in Dubrovnik. Mainly forested, this is a very green island with much of the northern end of the island protected as part of a Croatian National Park. 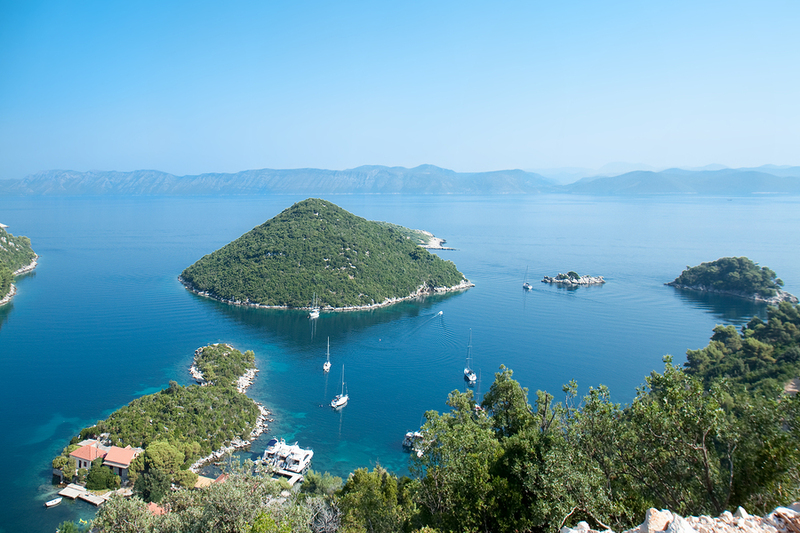 Considered one of the nicest islands in Croatia, surrounded by beautiful waters, Mljet is a natural stop on a crewed yacht charter along the Dalmatian Coast of Croatia. First identified geographically by Greco-Roman historians, the island was popular during Roman times as referred to in various ancient texts as Melite or Melita. In later centuries, the island came under the rule of the Benedictine Order, with a monastery built in the 12th century on an islet in what was then a fresh water lake. 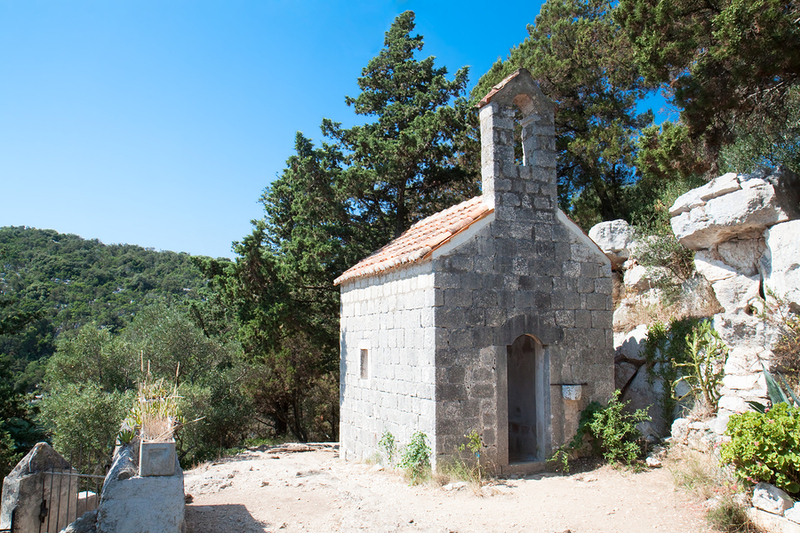 In the 16th century, the monastery was the center of the Mljet Congregation, a gathering of all of the Benedictine Monastic Orders in the Republic of Ragusa. By the early 1800’s the Benedictine importance had waned and the monastery was disbanded. Today, with visiting yachtsmen, the village of Polace is one of the most popular areas to visit. Polace is located on the northeastern end of the island and on the largest and safest bay, as protected by 4 small islands. 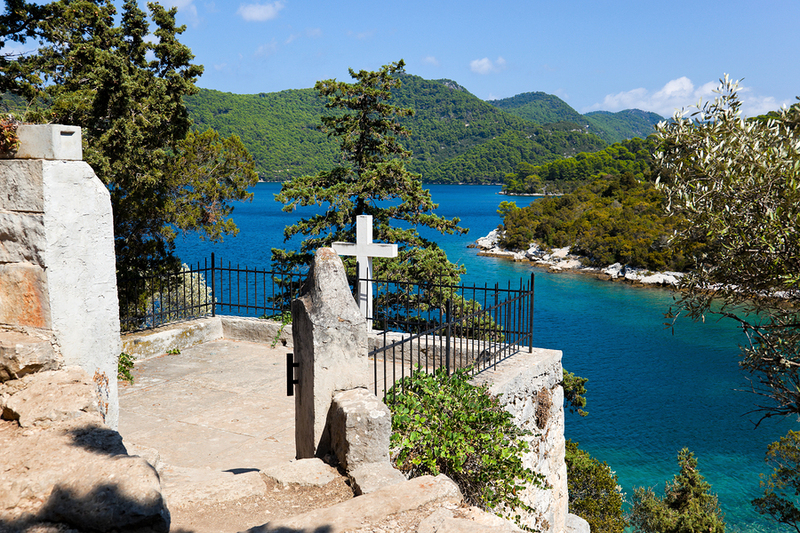 Surrounding Polace is the Mljet National Park with many hiking trails. Polace is also the location of a number of Roman ruins, including a large structure from the 5th century, the remains of a Roman Palace, the walls of which run right through the village. Hence the village name of Polace, or Palace. Located within Mljet National Park are two lakes, Veliko and Malo Jezero (Large and Small Lake) with buildings from the old Benedictine Monastery on Islet Melita in the middle. These lakes once were fresh water and are now salt water. It was the Benedictine Monks that changed the very nature of the lake waters that surrounded them, by building a canal from the lakes out into the sea. This changed the lake fresh water to salt water forever. Today the monastery building is a café restaurant and the lakes are a great location to swim, explore in the ships tender, or use water toys such as sea kayaks. 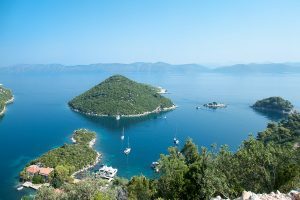 Mljet is a great yacht charter stop along the Dalmatian Coast of Croatia as part of any yacht charter itinerary when cruising along the southern coast, and island hopping on a crewed yacht charter.